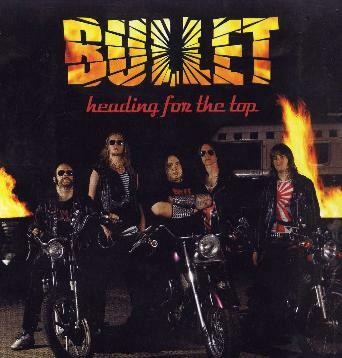 Bullet - "Heading for the Top"
Wow, talk about a kick back to 1981! This band sounds exactly like a cross between Brian Johnson era AC/DC, Hot Rockin' era Judas Priest, with a little bit of early 80's Scorpions thrown into the mix. Nothing more to say about this CD. The band presents nothing new here but if you could imagine a singer who could probably win an AC/DC vocal contest, with some hard rocking guys belting out early 80's heavy metal with a lot of guts... go for this one! Oh yeah, they are from Sweden! For more information you can visit the Bullet web site at: http://www.blacklodge.se.